Plenty of photos follow the review. Click on the pictures to enlarge. When it comes to designer brands, I usually look the other way. I don’t subscribe to purchasing a designer whatever just to look cool or be part of the ‘in’ crowd. I’ve often felt that many designer items are vastly overpriced and are not necessarily any better quality than a similar item that costs far less. 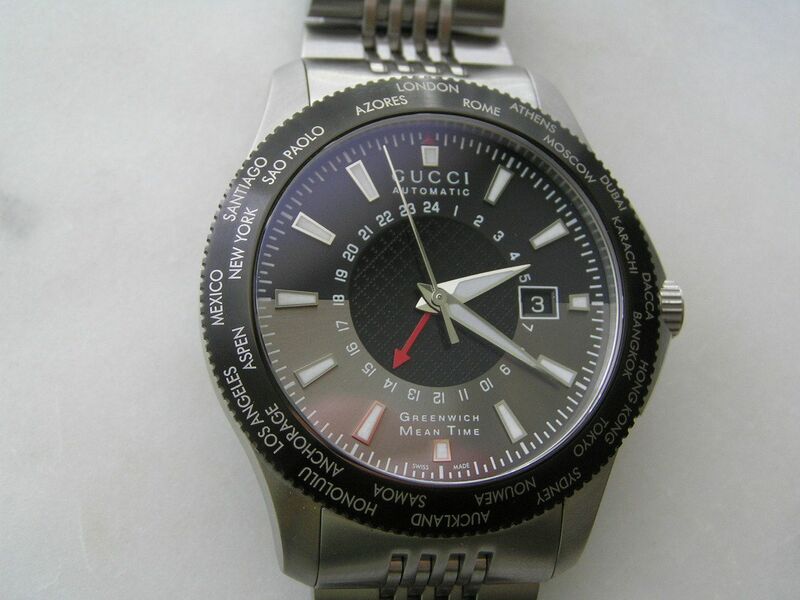 So why am I about to write a review on a Gucci watch? 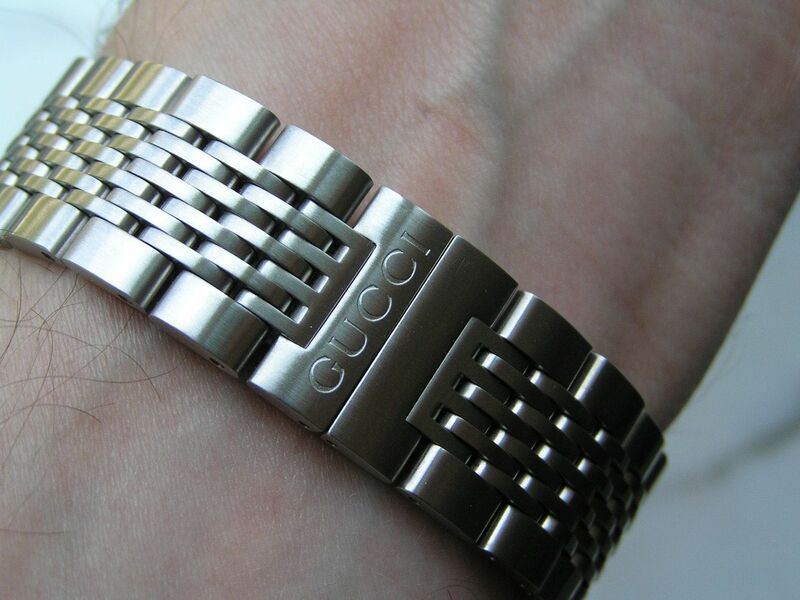 The answer is simple, I bought a Gucci watch and have been extremely impressed by it. Gucci is at the top of designer brand names and has a level of brand recognition that most companies could only dream of. They have quite an extensive array of watches, from quartz fashion types to more serious Swiss automatics, including divers and chronographs. For more than a few months (showing unusual restraint on a watch purchase for yours truly) I had my eye on this Gucci GMT. I liked the design and looks, but just wasn’t sure if it would pan out in person, so to speak. When it went on sale at what I considered to be a ‘pull the trigger’ price, I did just that and can honestly say, I am very glad I did. This watch looks much better in person than in pictures, as there is a level of detail on this watch that has to be seen in person to appreciate. I was initially concerned that it would be too large and just look dorky on my wrist, but the way the watch is designed, while still being on the big size, it is very comfortable, doesn’t wear clownishly large and looks fantastic. 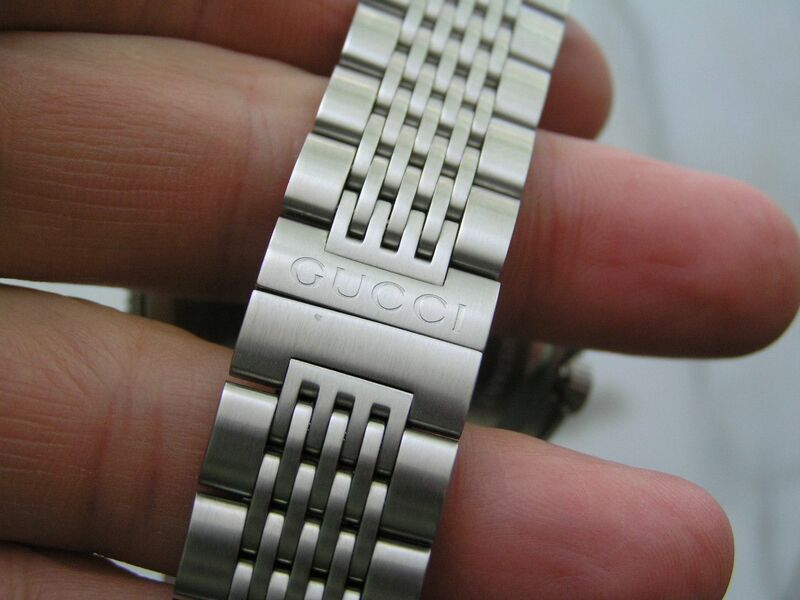 Gucci does not actually manufacture their own watches, but rather has their higher-end Swiss models made by Bedat. That’s good! The Timeless GMT starts with a fully brushed stainless steel case that measures 44.5mm without the signed (with the Gucci ‘G’) and thankfully non-screwdown crown. Lately, it seems too many watch companies are putting screwdown crowns on watches that don’t need them. If a watch has a modest water resistance rating, what’s the point? So kudos to Gucci for being sensible here. With the crown, the Timeless GMT is 47.8mm. An integrated crown guard protects the crown and is chamfered off enough not to look bulky but still manages to add a degree of protection. Lug tip-to-lug tip measurement is 52mm, so while the diameter is generous, the overall height is manageable. Think of it like the girl with wider hips but the rest of her being well proportioned. Lots to like there! Case thickness is 11.2mm, lugs are the odd 23mm. This watch is available with either a stainless steel bracelet or black leather strap. I opted for the bracelet, which for some reason, was priced less, so it was a no-brainer. The brushed finish on the case and bracelet is perfect for this watch, it makes it so much more casual and sleek looking. Overall fit and finish is very good and the weight and balance of the piece will not disappoint. 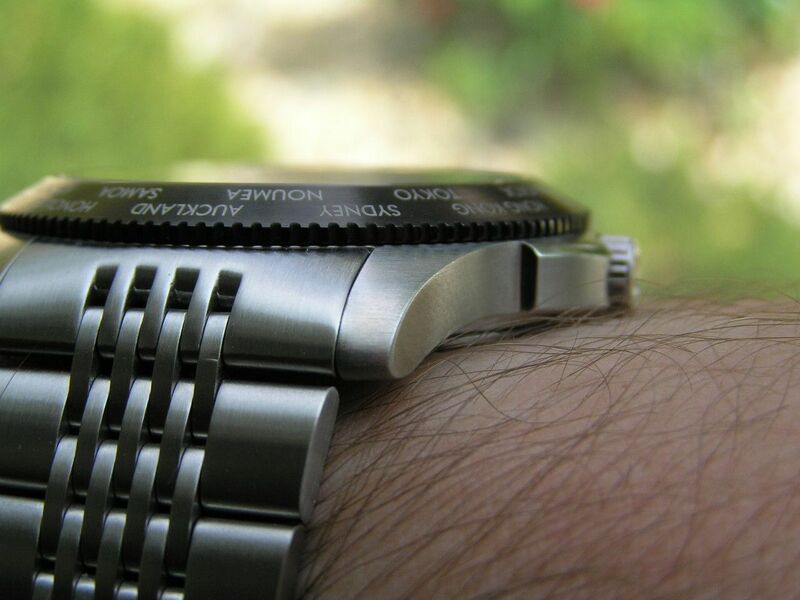 I was initially disappointed to see that the caseback was not a screwdown type, but rather the dreaded snap back. I despise snap-on casebacks because they are hard to remove and replace, but since I hardly have any quartz watches left in my collection and I don’t service my own automatics, the point has become rather moot. Still, the caseback on this watch is rather plain and unadorned, with the outer edge being the only polished area on the entire watch. 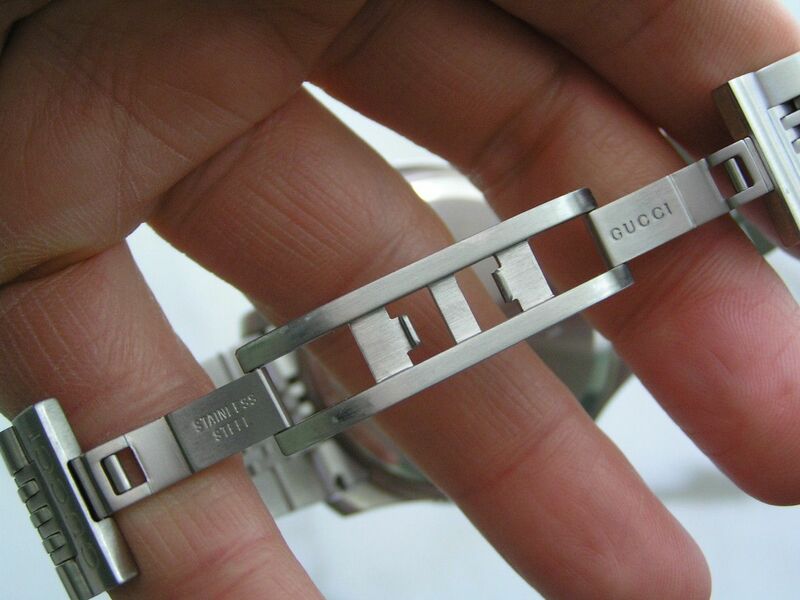 I was wishing they put more effort into stylizing the caseback rather than just putting the Gucci name on it, along with some miscellaneous wording and numbers. But, there is sometimes something nice about a simpler caseback, so this one falls in-between. Not the entirely sterile caseback of a Rolex nor the exquisite design of an Omega Seamaster. I’ll just call it nothing special. The dial on the Timeless GMT is really where this watch shines and where it exudes tons of class and style. 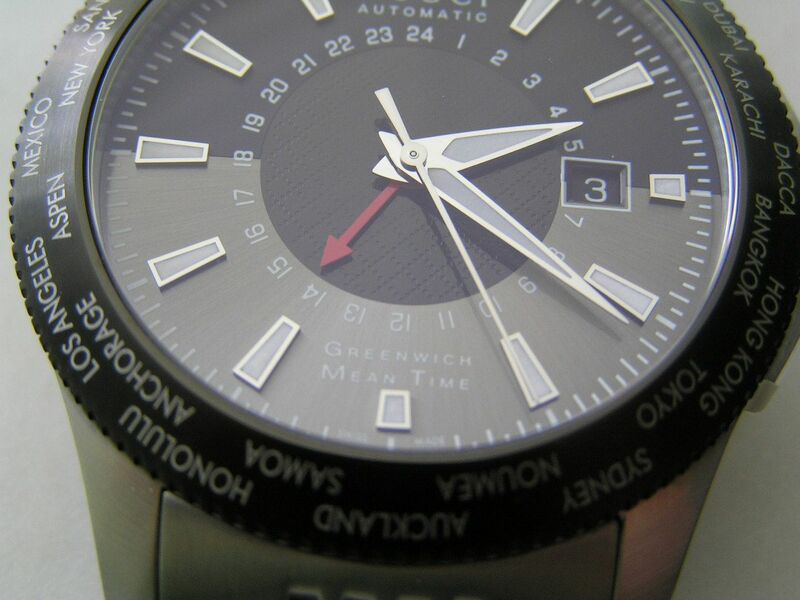 The center of the dial (which forms the 24-hour GMT ring and where the solid red arrow-shaped GMT hand resides) is black and semi-perforated. A ring of small white arabics from 1 to 24 encircle this part of the dial. I love the fact that this watch has a smaller GMT hand instead of a long, thin GMT hand as is usually found on GMT watches. To me, the smaller hand seems easier to read and doesn’t get lost on the dial between the markers. The hands are dauphine style, silver with inset lume, with the seconds hand being a simple silver stick, rather thin. The seconds hand could be a bit nicer, but it keeps in context with the class of the watch, so no major complaints here. The upper half of the dial is black, with the lower half a sort of shiny grey-brown. 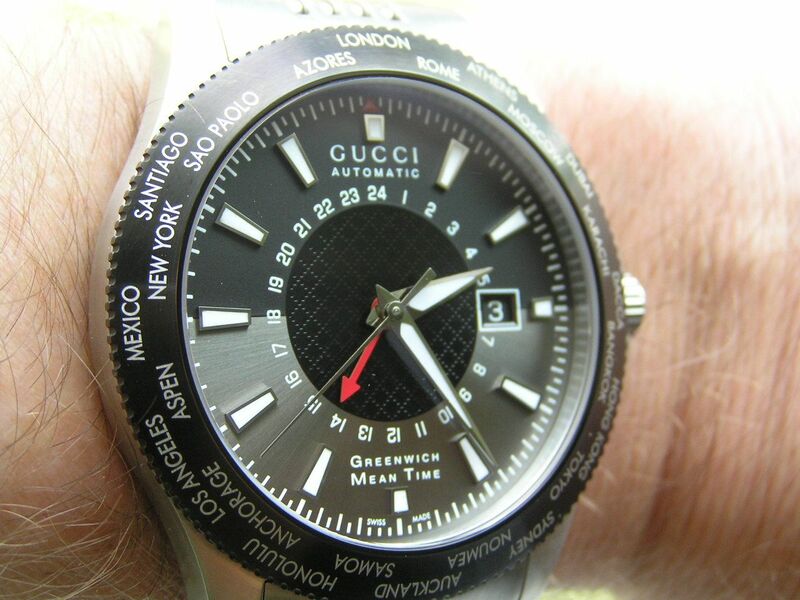 This is Gucci’s take on the AM/PM delineation that some GMT watches offer. It looks stunning! Luminous applied markers are found at each five minute mark, with smaller markers at the 12 and 6 positions. A painted red arrow resides above the 12 marker and is very subtle in its appearance. The dial does look like it could be a bit too busy, but due to the larger diameter of this watch, it really isn’t crowded. 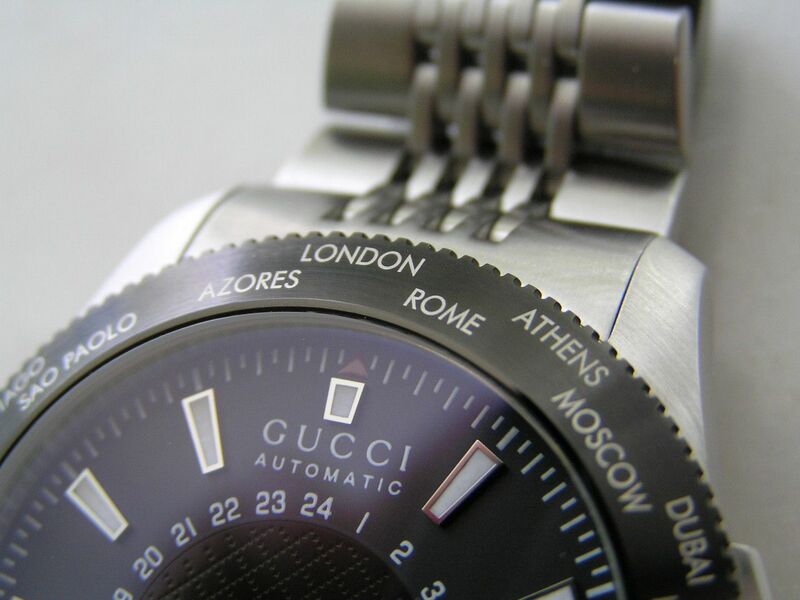 Below the 12 marker is the wording ‘Gucci’ and ‘Automatic’ and above the 6 marker is ‘Greenwich Mean Time’, a classier take on the usual ‘GMT’ of other watches. I like it! Under examination with an 8X loupe, I could detect no defects or dirt on the dial, just a nice clean build. A quickset date window is at the three position, framed with a thin silver rim. The date wheel is white on black and with the framing, is quite easy to read. Date wheel alignment within the window is fine. 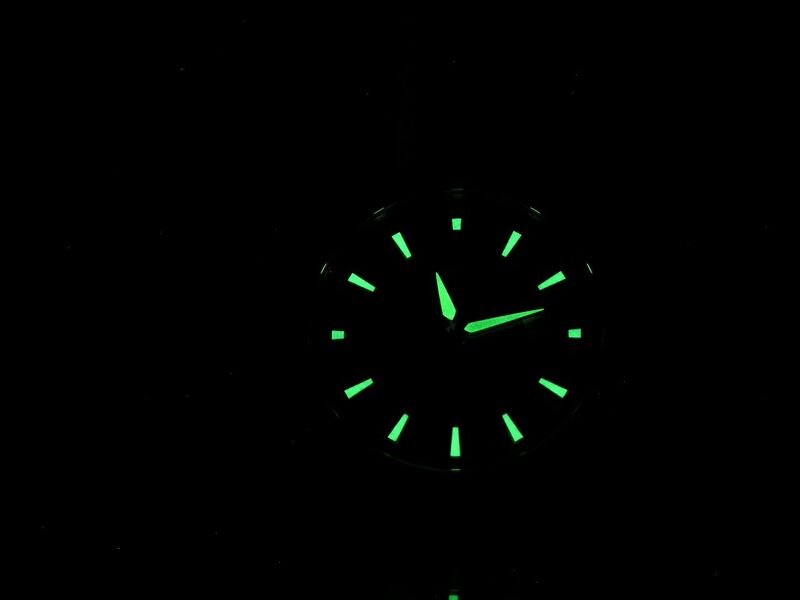 Lume quality on the Timeless GMT is quite good, given this is not a dive watch. 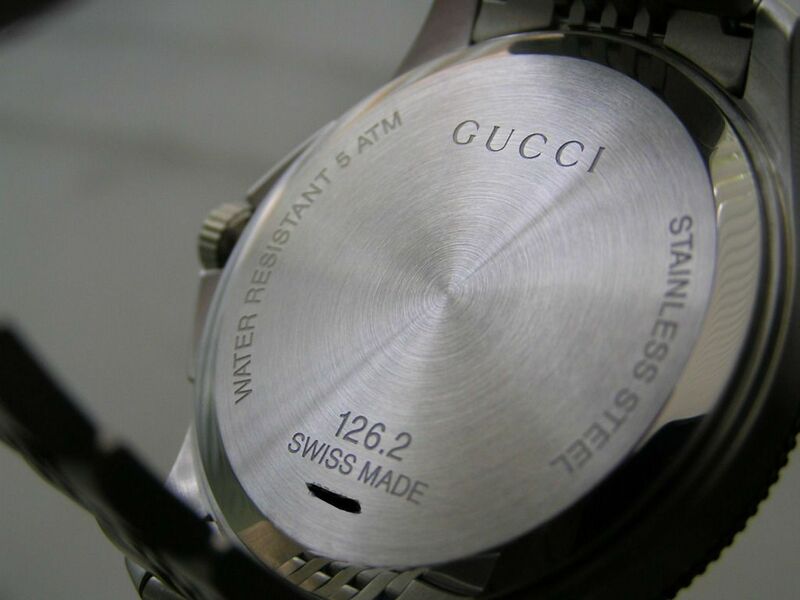 The watch is factory rated at a modest 5 atm of water resistance. Capping the dial is a flat sapphire crystal with absolutely no distortion. 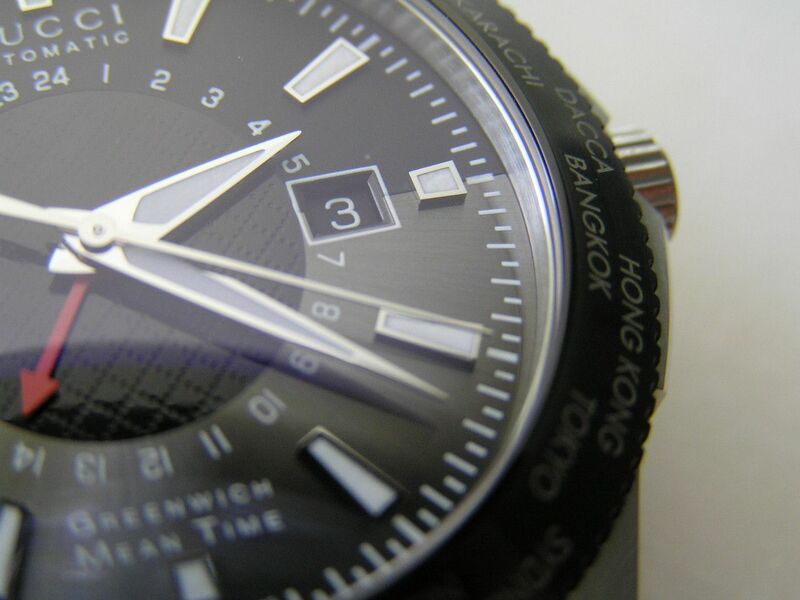 A black anodized omni-directional cities bezel finishes off the dial area. The bezel has 23 cities listed on it and clicks into position at each city location. The cities are just printed on the bezel in a silverish color and hopefully will not rub off due to wear, but overall, the bezel is a quality piece of engineering and looks superb on this watch. The black color of the bezel adds just the right amount of sportiness to this piece. Inside the Timeless GMT beats a Swiss Made automatic movement, presumable an ETA 2893. Since the caseback is not a display type, the documentation does not mention what the engine is and I’m not about to crack the back to check, this is my best guess. 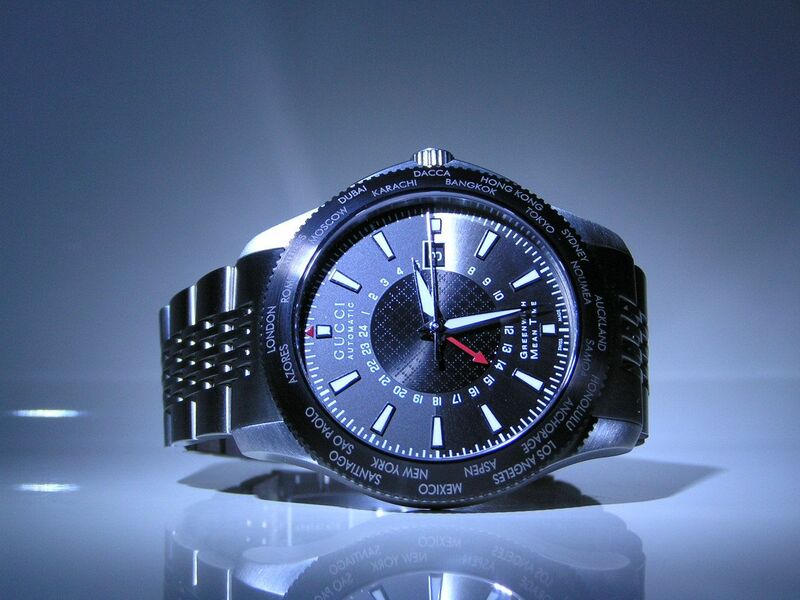 The GMT hand is independently adjustable in one-hour increments. The watch handwinds and hacks and keeps great time, running about +8/24 hours with a long 48-3/4 hour power reserve. The stainless steel bracelet features solid multi-piece links (nine pieces) with solid end links and a continuous style design signed on one link where the butterfly style clasp joins together. 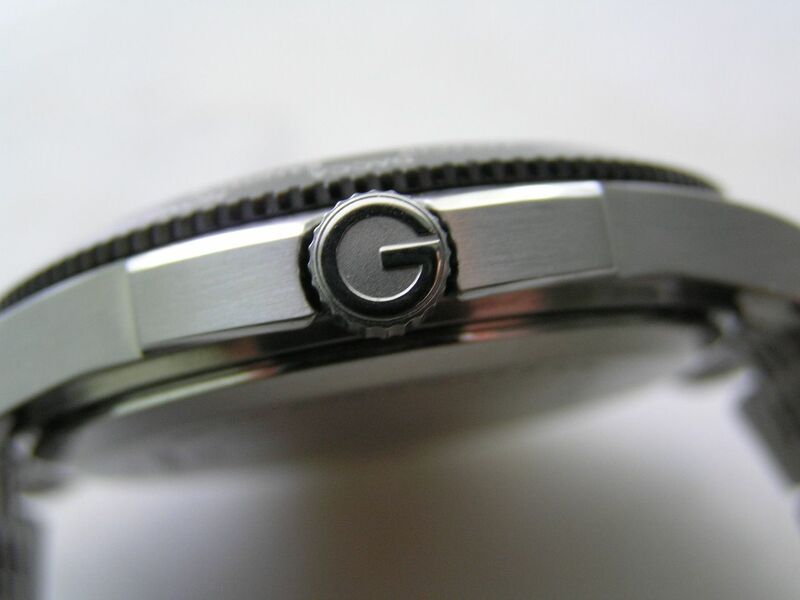 The bracelet is fully brushed, to coordinate with the finish on the watch case. The deployant is machined and signed, but unfortunately does not have a pushbutton release, so you have to just tug on the bracelet to get it opened. 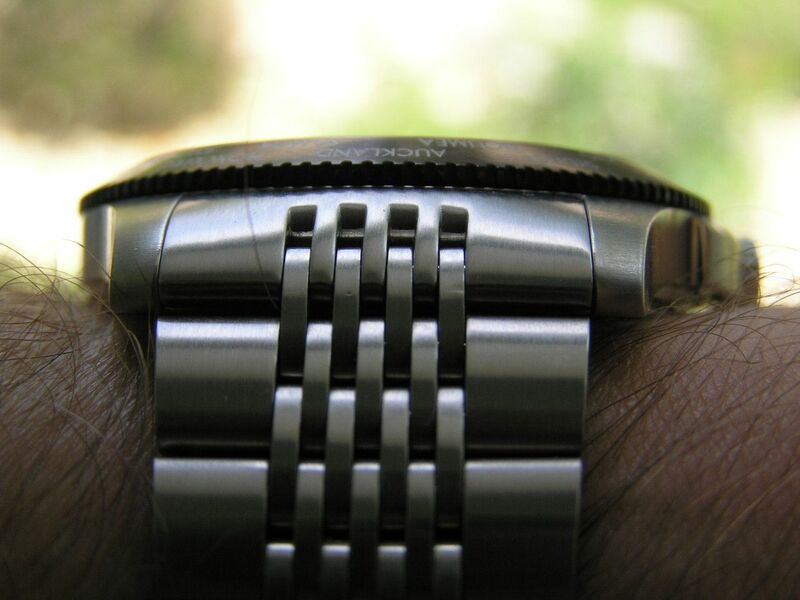 It is not real tight, so you don’t have to pull too hard, but a watch at this price point and overall level of design needs a pushbutton on the clasp to do things right. Demerits here from me. Also, due to the continuous style design of the bracelet, there are no microadjustments and no half-links, so getting a perfect fit may be tricky. The links themselves are not too big, so this aids in getting a better fit, but this is one reason I tend to not like continuous style bracelets. Luckily, for me, I was able to achieve a decent fit with this watch. Link removal is by standard split pins. The bracelet measures 23mm at the lugs and tapers to 17.9mm at the clasp. Presentation was fairly straightforward, a nice, but rather simple box that has a single cardboard piece that fits over the inner box. 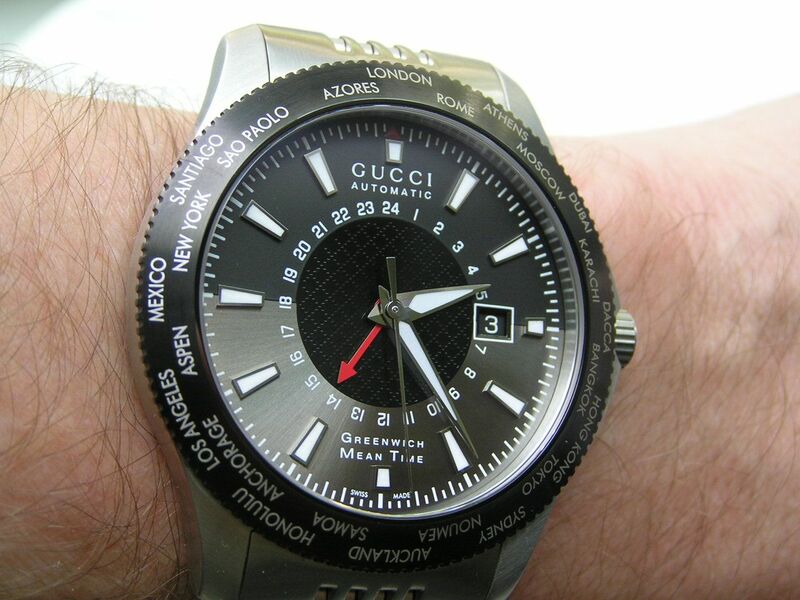 Overall, the Gucci Timeless GMT is a classy, somewhat dressy, somewhat sporty very functional watch that exhibits great build quality, a unique and wonderful looking dial and the cache of the Gucci name. Bellissimo! Verdict: stylish, dependable and well-made, the Gucci Timeless GMT is the perfect addition to your collection if you’re looking for a GMT watch that is a bit different but with tons of personality. Thanks for reading and enjoy the pictures. Very nice indeed, i know what you mean about the branded name though. 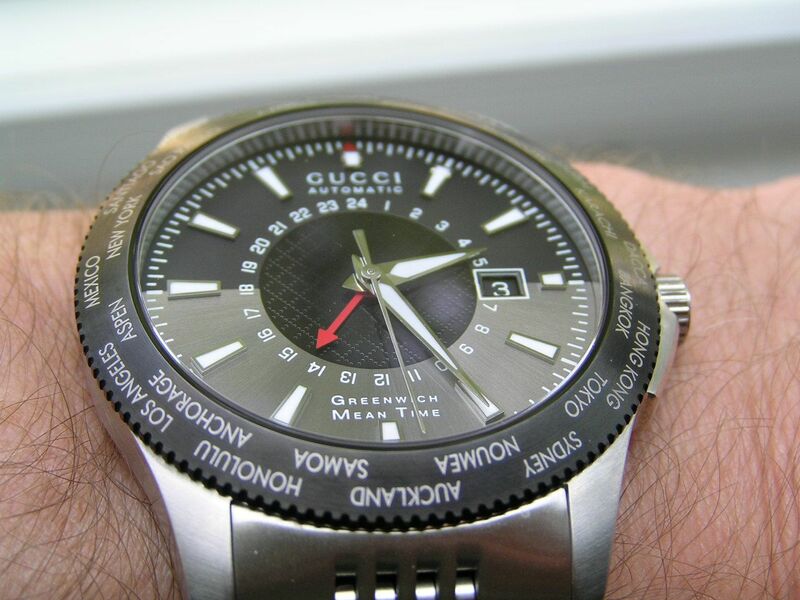 I had a Gucci some years back, although a quartz its time keeping was superb for at least 3 years on a battery. Yours does look a quality piece with a timeless look, a good choice. Great review very clear and honest! I found this watch here in Japan for U.S. $ 590 should I buy? By the way, the model that I found here in Japan is with leather strap. Yes, that's a good price. Go for it. 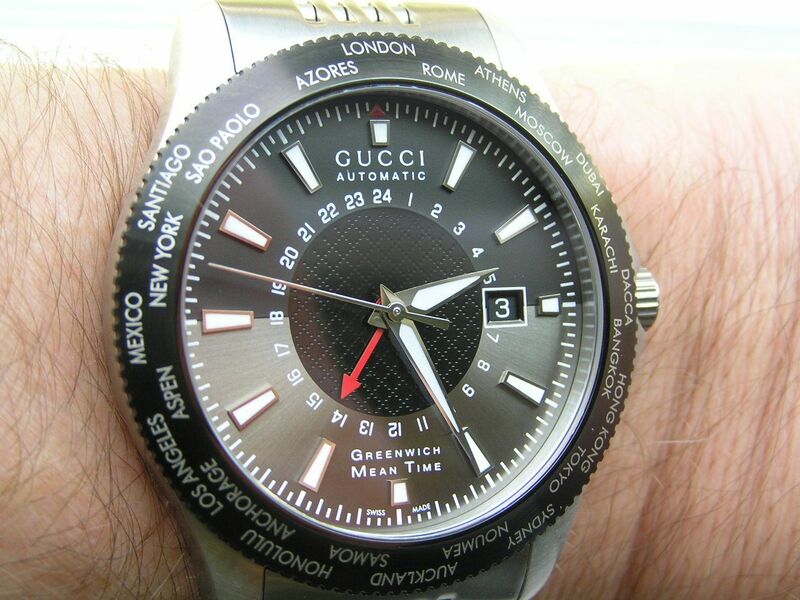 Excellent review and I can testify this Automatic Gucci watch is very nicely made and will be a great addition to any serious watch collector. I have been a professional writer for over 30 years and a watch enthusiast/hobbyist for over 20 years. Have a watch you want reviewed? Are you a manufacturer, retailer or hobbyist that has a watch you would like to have reviewed by me on this blog? Please email me through this blog and we can get started!